Extreme Tree Works believe's in treating our clients by giving helpful advice and recommendations, as well as answering all of your questions to the best of our abilities in a reliable fasion. 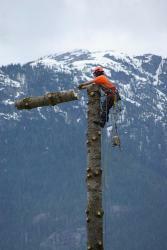 We offer quality work to homeowners, in the Lower Mainland area. We are an established, fully-equipped, and professional company serving many customers every year. -Reasonable rates, will beat any written estimate.